I just love getting all dressed up from time to time. And pretty dresses are definitely a weakness of mine! I especially adore this dress that I recently received from Chi Chi. It’s their Daisy dress, and it’s so lovely, and the flowers make it an ideal dress for spring time. It has sweet embroidered daisies on the front of the bodice, embellished with crystal centres. The top is fitted and the bust comes with padding, so there’s no need to wear a bra, and it has a lovely floaty chiffon skater skirt. The contrasting colours are black and a very pale pink (I thought it looked cream online), which means I don’t need to buy a new pair of shoes, because it goes with my black wedge ones.. yay! In these photos I’ve accessorised with a beautiful clutch bag that I was sent from Vintage Styler. 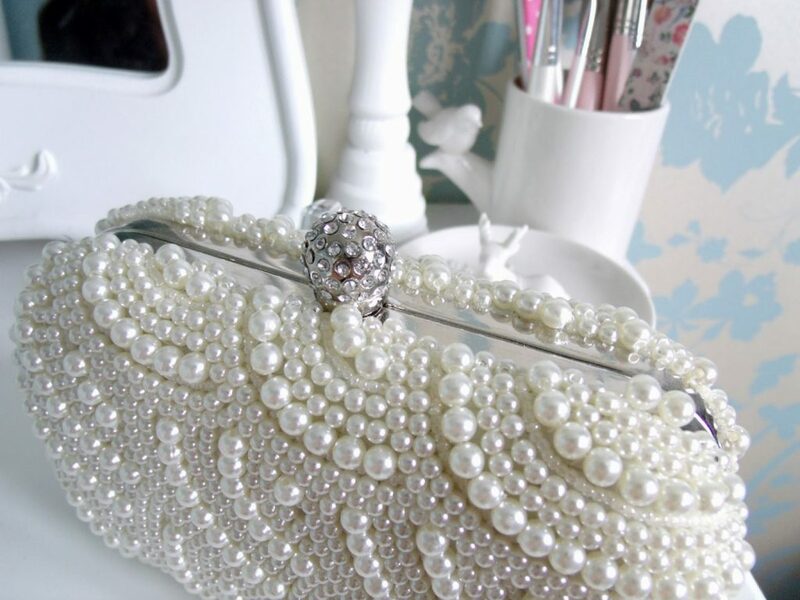 It’s their Art Deco Bridal Pearl Box Clutch, that would be absolutely perfect for any bride or bridesmaids wedding. I think I’m going to lend it to my sister for her big day next year! It’s so, so pretty, decorated with tonnes of little pearls of different sizes in a scalloped pattern. It has a sparkly diamante clasp as well as a removable chain strap. I absolutely love pearls, so this will go with a few pieces of my favourite jewellery too. And although it’s quite small, it’s large enough for my big smart phone and more. This is a really cute dress and looks great on you 🙂 And the bag is gorgeous – right up my street! Love reading your blog – it's definitely one of my favourites.